This article first appeared in the Rushville Republican on February 7, 2017. In 2002 the first breast cancer awareness license plates were made available. Since its inception nearly $3.0 million have been distributed to local organizations by the Indiana Breast Cancer Awareness Trust (IBCAT). The competitive grant is awarded throughout the state to organizations that use innovative projects for screening mammography services for medically underserved populations in Indiana. The mission of this IBCAT trust is to increase awareness and improve access to breast cancer screening and diagnosis throughout Indiana. In the fall of 2014 Rush County was identified by the Komen Foundation as a targeted population in Indiana to increase its reach to the underinsured/uninsured for mammography and breast health care services. The morbidity rate from breast cancer ranks high among counties in Indiana. Rush Memorial Hospital has been notified by IBCAT that they have been awarded $18,660.39 to assist with its breast health programs. Rush Memorial Hospital for 2017 has also been awarded a second grant for breast health patient support services in the amount of $10,000. 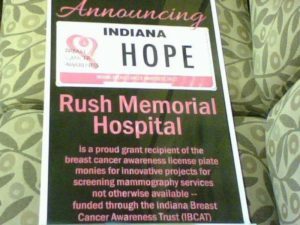 Monies for the IBCAT are raised through the sale of the Indiana Breast Cancer Awareness specialty license plate. This plate was the idea of the late Nancy Jaynes, a Plymouth High School family and consumer sciences teacher who lost her battle with breast cancer in 2008. Her vision was that the license plate would be a traveling billboard and reminder about the importance of early detection for breast cancer. It is believed that her vision has made a difference in the lives of thousands of Hoosiers. This specialty plate can be ordered through myBMV.com or at the local license branch for an additional $40. $25 of this fee goes to IBCAT and qualifies as a tax-deductible donation (to the extent of the law). For more information about the trust and the programs it funds visit www.breastcancerplate.org or call 866-724-2228. For information concerning Rush Memorial Hospital’s breast health services contact Erin Pike, patient navigator, at 765-932-7025. Underinsured/uninsured patients may qualify for available funds for their breast healthcare screenings. Acting now could save a life – even your own.